Designed originally as a best-of-all-options for the defensive pistol world, it was targeted to be an all things to all people service pistol cartridge. Sort of a hybrid of the service pistol standards, .45 ACP and 9x19 rounds. The goal? To have more capacity than the .45 and be more powerful than the 9mm. Without completely retelling the detailed history, in the early 1970s, the late Jeff Cooper was reportedly looking for a round that combined the advantages of both velocity and momentum. The ballistics of a 200 grain .400 (10mm) diameter bullet traveling 1000 feet per second looked good to Jeff on paper. There was a problem, however. There wasn't a readily available cartridge case for an auto pistol that would handle that bullet diameter. So it wouldn't be as simple as just powering up an existing cartridge as had been done with .38 special, .38 auto and .44 special. A new case had to be devised. Well, maybe not new, but altered and repurposed. So, what to do? The combat pistol world was in its hey day and the buzz over this new combination was eagerly awaited by pistol enthusiasts worldwide. As time dragged on and the Bren Ten didn't seem to be happening, Colt stepped in and introduced a model to accept the 10mm. While familiar, it really wasn't the totally new, complete package we were all hoping for. Norma, the company that originally developed the 10mm, in their enthusiasm to make the round as good as modern propellents would allow, made their ammo far more powerful than was originally requested. The ammo was approximately 20% higher in velocity than the original specifications called for. While this sounds like a good idea, it was in fact not. At least not for service pistol use. To add to the overall problem, the Bren Ten Pistol was long delayed and in the end, sadly never made it. Some were built, but they too couldn’t take the beating of the “hot” Norma ammo. Other manufacturer's 10mm guns did not deliver on the promise the 10 had made. They were harder to shoot than .45 in the same platform and did not hold up well to the very high-pressure ammunition. So for most shooters, the existing 1911 platform pistol with the powerful 10mm ammo just didn’t offer enough benefits to replace the already-available and time-tested .45 Auto. Although too hot for most applications for a service pistol, the 10mm with its potentially higher power levels continued [slowly] to make friends in the civilian and LE world. A lot of shooters still wanted a 1911 with more velocity, penetration, momentum, energy and flatter trajectory than the .45 offered. The 10mm’s devout but small following, by those who recognized its niche, soldiered on. The FBI adopted the 10mm after the infamous 1986 Miami shootout, where they unfortunately discovered that they needed more gun, power and firepower than they currently had. Better materials, 10mm-particular specifications and improved manufacturing capabilities allow us to produce superior, more-durable 10mm pistols. Specifically, one that will withstand the force of the “hot stuff” and still work with the lower pressure “standard ammo”. First and most importantly, the GUN. Following our stringent TRP™ specifications, the Springfield 1911 with RMR® is a perfect fit for the cartridge. It’s the best of everything; quality, accuracy, durability, and reliability - a great handling pistol indeed. 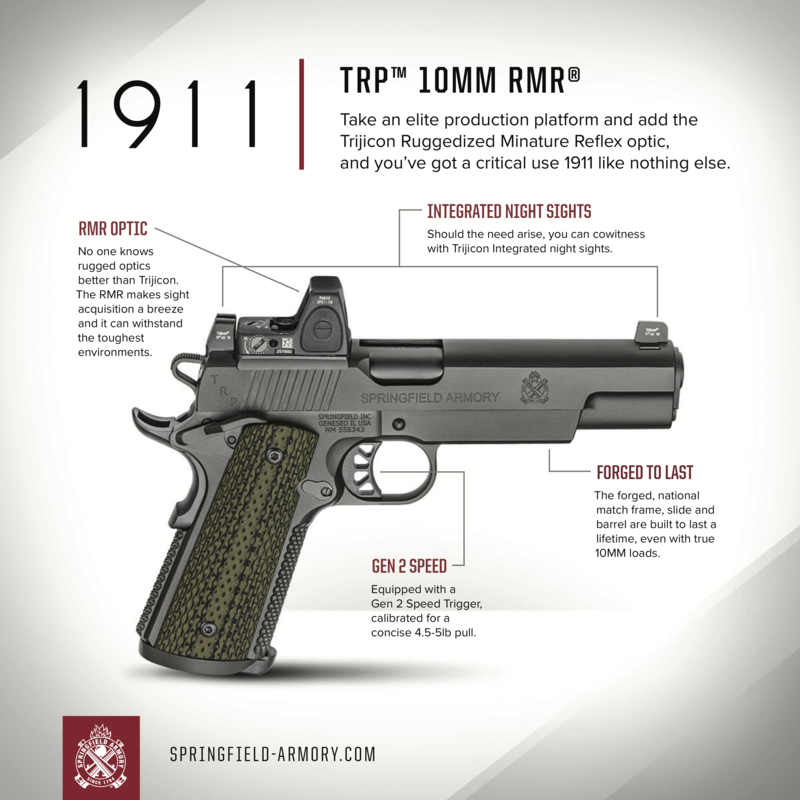 You can drool over the TRP™ specs at Springfield-Armory.com, but I suggest you drop into your dealer to see and handle one for yourself. In your hands, there’s no denying the excellence and perfection. You‘ll feel the heft, the tight fitting of the slide to frame and the clean, crisp trigger pull. All the workmanship and upgrades that scream quality are readily tangible and visible. Second - the optical SIGHT. For many shooters, aiming is difficult. Some eyes just don’t see that well. While vision issues can be resolved with glasses or contacts, there is almost always a compromise. You can correct vision to either the sights or the target, but one of them is NOT going to be in focus. Third - the 10mm CARTRIDGE. As we’ve discussed, the 10mm is the most powerful round commonly available that fits the 1911 platform. It can be a viable "all things to all people" chambering. For you speed junkies, the 10mm offers high velocity. Some loadings of the 10 have bullets going upwards of 1300 FPS. This guarantees high energies and flat trajectories. For the big-and-heavy-is-better guys, the 10mm bullet is .400 inch in diameter and regularly available in 200 grain weights. So it’s a perfect fit for those who like the old saying, “I don’t care what caliber it is as long as it starts with 4”. And if what you want in your next firearm is a pistol that is powerful, has range, is easy to aim, fun to shoot, high performing, with flat shooting ammo, then one of these Springfield Armory® TRP™s may just be your perfect gun. Check it out at the friendly neighborhood gun store and tell them Rob sent you.